Let me first start by saying, yum. This didn't make it out of the ice cream maker before babygirl and I tore into it. 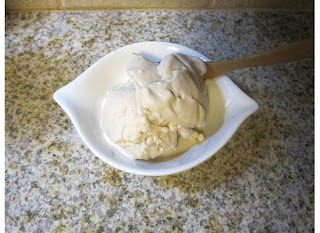 I used our basic coconut milk ice cream recipe and added amber agave and lacuma powder. Be sure not to substitute the dark for light agave in this recipe and use a good quality lacuma. Both of these together is what gives it a delicious caramel flavor! So good and better for you than conventional dairy caramel ice cream! Mix all ingredients together separately and then follow your ice cream makers instructions. You can also freeze this in ice cubes and then blend in a high speed blender such as a vita mix.